Six Flags Great Adventure, Jackson, New Jersey, will introduce a second major addition for the 2019 season, Calypso Springs. This massive activity pool is Six Flags Hurricane Harbor’s largest new attraction since the waterpark opened in 2000. 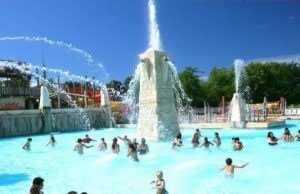 The key features of Calypso Springs include a massive, 100,000-gallon (378,541 liter) beach entry-style pool, an obelisk-style fountain with spontaneously erupting geyser, a giant, open lounge deck with hundreds of chairs for sunbathing, oversized umbrellas, Bimini shade covers available for rental, and a new dining location. Calypso Springs will be located between the Taak It Eez Ee Creek lazy river and Tornado water slide. It is slated to open summer 2019. The 45 acre (18 hectare) Hurricane Harbor waterpark also features a million-gallon (3,785,412 liter) wave pool, a half-mile (0,8 km) lazy river, more than 25 high-speed thrill slides and two interactive children’s water playgrounds.